Info "Fronk here. Fronkity fronk fronk Swing the rope and the little Warios will jump. Yaay!" On the Ropes is a microgame in WarioWare: Smooth Moves. It is only in Wario's stage. The name comes from the idiom "on the ropes," which describes an opponent who is about to be defeated. The player controls the rope in a game of jump rope with three buddies. 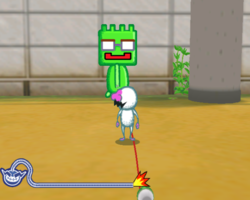 To win the microgame, it is necessary to swing the rope so the jumping character can jump over the rope. 1st level difficulty: The player swings one person. If done correctly the single person cheers with his friends. 2nd level difficulty: The player swings two people. If done correctly, the last person to go runs and knocks the other two people down. 3rd level difficulty: The player swings three people. If done correctly, the last person again runs, but the two people jump over him. This page was last edited on February 18, 2018, at 20:06.